Every business carrying out a taxable supply of goods or services under GST regime and whose turnover exceeds the threshold limit of Rs. 20 lakh/10 lakh (as applicable) will be required to register as a normal taxable person under the GST regime. 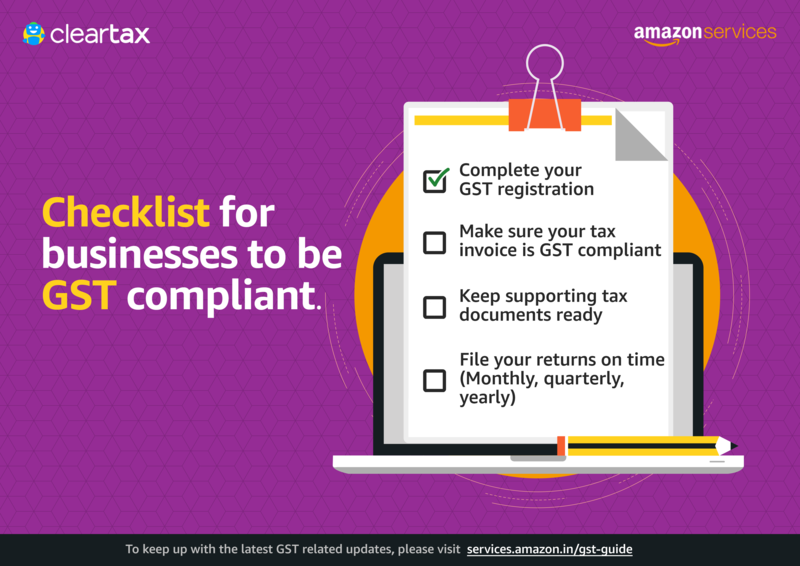 If you sell or are planning to sell on Amazon.in, GST registration is mandatory (except for GST-exempt categories). If you require assistance, you can follow the process mentioned in our How to Register for GST article. GST registration is critical because it may be mandatory for your business and also it will enable you to avail various benefits that are available under the GST regime. You can also avail ClearTax’s services, to register your business under GST. One such benefit is to avail seamless input tax credit. If you have a VAT/CST registration and have not migrated to GST, please contact your CA/Tax Consultant immediately for migration to GST. GST Act along with GST Rules have defined the invoicing rules and formats. An invoice or a bill provides a list of goods sold, along with the amount due for payment. A person registered under GST must issue GST compliant invoices. There are two types of invoice that are issued under GST. 1. The taxable invoice which is issued to pass /avail GST credit. 2. Bill of supply, which is issued when the supply is exempted or no GST credit is passed on / availed. Under the new GST regime, sellers need to file their returns on a monthly basis. By the 10th of the month, sellers need to file GSTR-1 form on the GST portal, which contains details of their taxable supply of goods/services for the previous month. Between the 11th and 15th of the same month, sellers need to update their input tax components (purchases details of taxable goods/service) and other details regarding their input tax supplies in GSTR-2 form. The GSTN portal will then auto-populate GSTR-3 form, which the seller needs to validate and make the necessary payments by the 20th of the same month. Annual returns for a financial year need to be filed in GSTR-9 form by December 31 of the next financial year. It should be noted that there is no mechanism of filing revised returns. The rectification of errors/omissions is allowed only in the subsequent returns. Amazon.in sellers can avail a special offer from ClearTax Biz to help them file their GST returns. An added benefit of this service is their seamless integration with Amazon.in account, enabling faster return filing. You can read more about this offer here. By using ClearTax Biz, you agree that the product /solution is provided by Defmacro Software Private Limited, to the complete exclusion of Amazon Seller Services Private Limited ("Amazon"). Amazon disclaims all liability and assumes no responsibility for consequences resulting from your use of or reliance on the ClearTax Biz product/solution. One should note that failing to furnish form GSTR-1, GSTR-2, GSTR-3 or Final Return within the due dates attracts late fee of Rs. 100 per day, subject to a maximum of Rs. 5,000. We hope this article will help you be GST compliant and run your business smoothly.